Are you looking for a fun way to keep your kids busy this summer? We love board games and the entire family enjoyed playing Bejeweled Frenzy from Hasbro for review! It is a fast paced card game for ages 8 and up. My 10 year old and her friends had a blast playing! It was challenging enough to keep them interested, but not so challenging to discourage them. 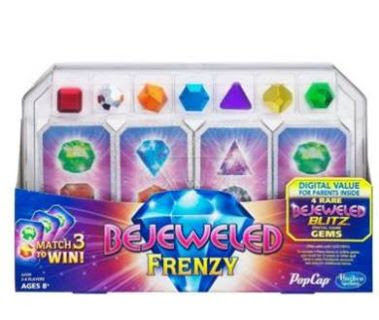 Want to win you own Bejeweled Frenzy game? Enter below for the giveaway! Not to sure what my fav game of the summer is but I sure do enjoy swimming in the summer to cool down! I am a huge scrabble fan in the summer. I also like the game of life for a group. Monopoly was always my favorite game! My son and I play a lot of cards in the summer because they are easy to transport. We like to play Rummy while sitting outside. Ummm there is too many to mention! We love playing family games whenever we get a chance! Scrabble is one of my favorite board games for summer. I don't really know. We haven't played board games in forever!